When the brisk wind is chilling your bones and the only hint of color in the landscape is a few evergreens it is hard to think of landscaping, but what better distraction from the dirty slush than to dream up your ideal outdoor living space. Our design team is eager to listen to your desires and make them a reality. 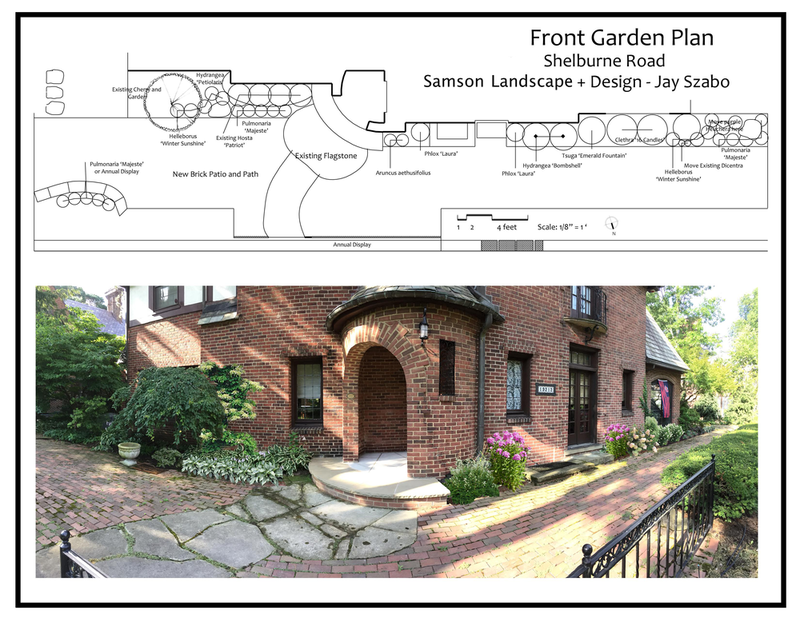 Jay Szabo, our lead landscape designer brings 38+ years of horticultural and design experience to our customer driven planning process; we listen to your desires and needs then create a blueprint and rendering so you know exactly what to expect before we break ground. Many landscaping companies use a cut and paste design method which pays no attention to your needs or the existing attributes of your home. There is a wealth of perennial plant material including Heuchera 'Forever Purple' , Monarda 'Coral Reef', and Astilbe chinensis 'Pumilla' that when professionally selected will complement and revitalize your home. Below is an example of one of our carefully planned landscape designs. In addition to breathing new life into your garden with colorful perennials and hardy new varieties of fast growing trees we are ready to hear how we can put our masonry skills to work to create the outdoor living space of your dreams. Maybe you are thinking of a new patio with the endless options of Unilock Pavers, or creating a classic look for your Shaker Heights or Cleveland Heights home with Beldan victorian fired clay pavers? Maybe you are thinking of adding a fire pit with a Zentro smokeless insert like the project below? Are you dreaming of colorful gardens, a new lawn, low maintenance water feature, outdoor kitchen, retaining wall, patio or walkway? Our team is here to cure your winter blues by giving you a new landscape to look forward to this spring. Our schedule is already filling up, so please contact us today to schedule a consultation. Samson Landscape and Design services Moreland Hills, Chagrin Falls, Hunting Valley, Pepper Pike, Lyndhurst, Shaker Heights, University Heights, Cleveland Heights, Geauga County, Cuyahoga County, and all other Cleveland suburbs.